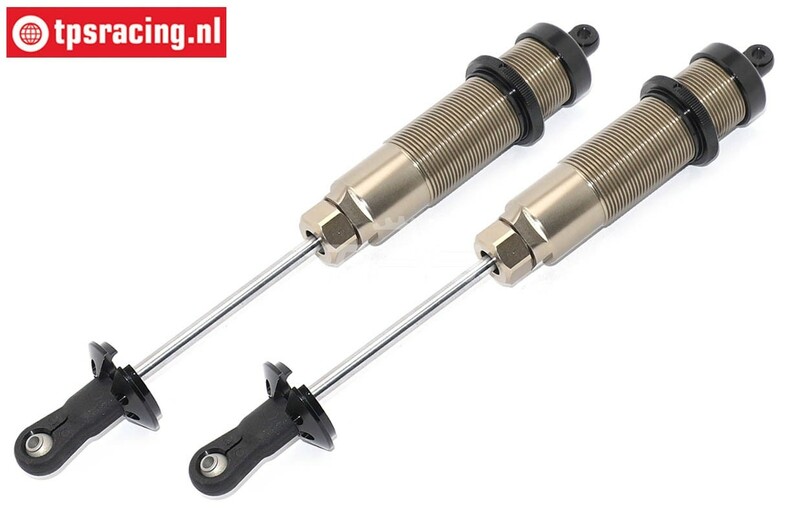 New set of FG shock absorbers with a large volume and long stroke. These shocks have triple guidance and sealing with two solid silicone O-rings at the bottom. The 6 mm thick shock rod is equipped with an interchangeable ball head and is adjustable. The entire shock is very robust by using high quality materials with a beautiful finish. 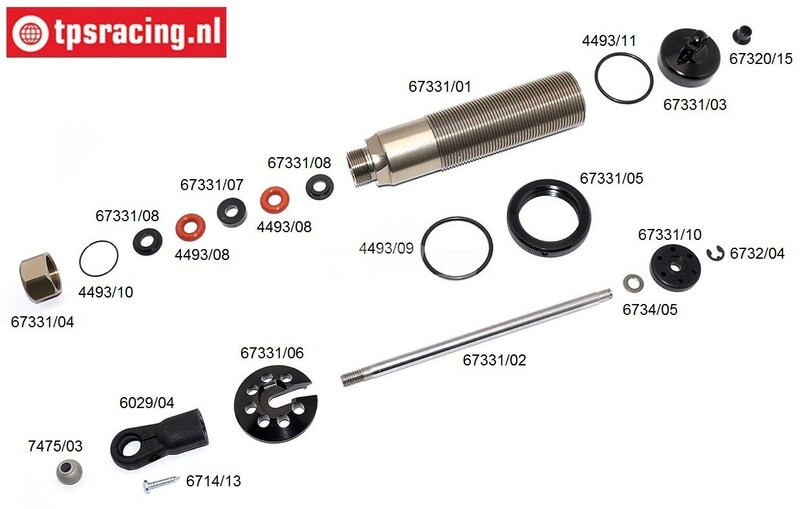 Delivery consists of 2 shocks, excluding springs and damper oil. FG66295/025 Silicone oil FG250, 100 ml, 1 pc. FG66295/050 Silicone oil FG500, 100 ml, 1 pc. FG66295/075 Silicone oil FG750, 100 ml, 1 pc. FG66295/150 Silicone oil FG1500, 100 ml, 1 pc. FG66295/200 Silicone oil FG2000, 100 ml, 1 pc. FG66295/100 Silicone oil FG1000, 100 ml, 1 pc. FG66295/080 Silicone oil FG800, 100 ml, 1 pc. FG67316 Shock spring Yellow Ø2,6-L145 mm, 2 pcs. FG67317 Shock spring Red Ø3,0-L145 mm, 2 pcs. 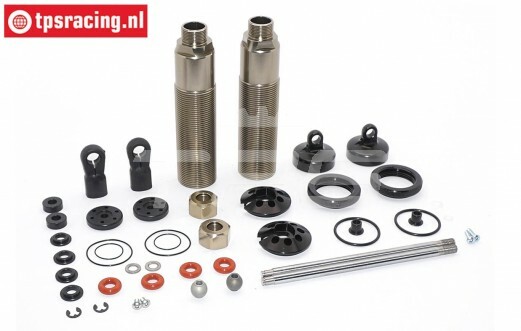 FG67331/01 Shock housing Ø30-L115 mm, 1 st.
FG67331/03 Upper Shock Closure Ø30 mm, 1 st.
FG67331/02 Shock rod Ø6-L129 mm, 1 st.
FG67331/04 Lower Shock Closure Ø17 mm, 1 st.
FG67331/05 Shock adjustment ring Ø30 mm, 1 pc. FG67331/07 Shock lower guide bushing, 2 pcs. FG67331/08 Shock lower guide washer, 4 pcs. FG67331/10 Shock piston Ø24 mm, 2 pcs. FG4493/08 Shock O-ring Ø6 mm, 4 pcs. FG4493/10 Shock O-ring Ø16 mm, 4 pcs. FG4493/09 Shock O-ring Ø26 mm, 4 pcs.